This fish of the picture is grown anglerfish. The color of the backside of the body is dark brown, and the abdomen is white. The distinction with another anglerfish is that this anglerfish has a long tail and some white spots are not seen in the mouth. It is necessary thing in the food served in a pot in Japan is liver, fins, gills, ovary, stomach, skin and meat. 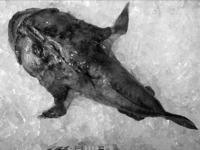 This fish is called “Honanko; A real anglerfish” in the market and loved.